It was a gorgeous day out on the water today aboard the Sanctuary! 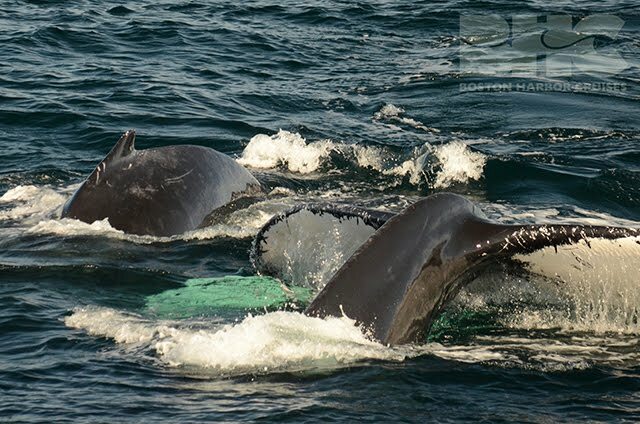 Our 10am trip started off strong with a beloved mother and calf pair who have returned to Stellwagen Bank! Up until today, we had not seen Owl and her calf since May! It was quite a relief to see the young calf healthy and kickin’. Just prior to our last sighting of this calf, it had encountered two separate entanglements! While it looks like the wounds have healed up well, there’s still some raw areas that have yet to heal (see photo)! 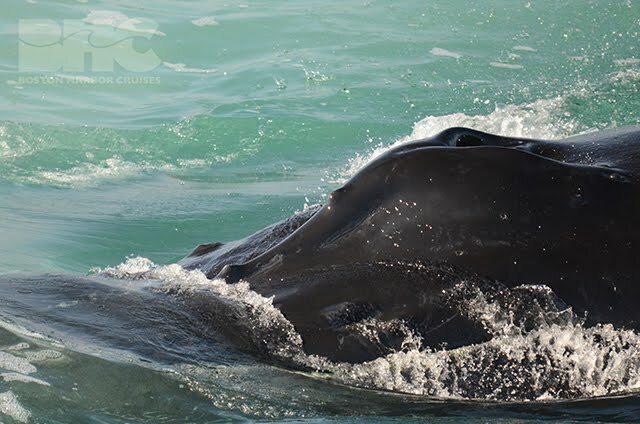 Nonetheless, the calf spent some time independently from mom and seems to be growing quickly! We then moved on to Cajun, calf and Pele whom we watched briefly as they dove and surfaced, likely subsurface feeding. 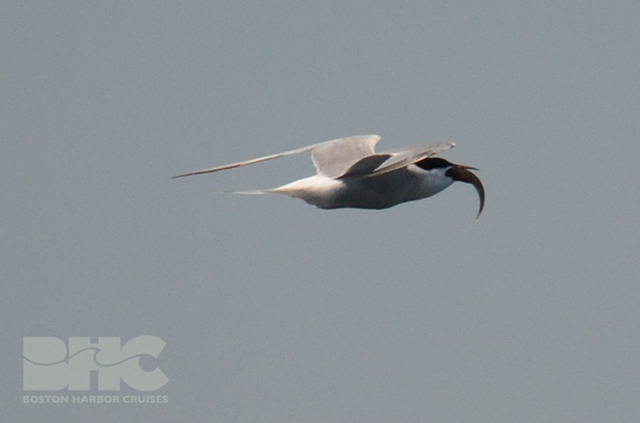 As we watched the trio, a small tern flew by with a GIANT bird in its mouth which definitely pleased some birders on board! This afternoon, we returned to Pele, Cajun and her calf. 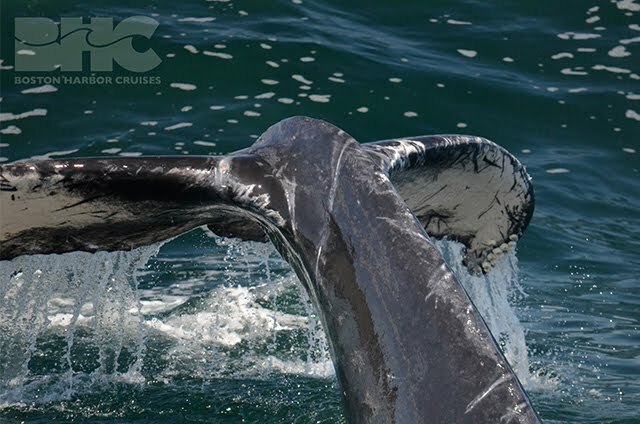 We began getting pumped up as we approached this sighting, seeing from miles away that this calf was flipper slapping! Cajun’s calf displayed a range of surface active behaviors as Cajun and Pele fed beneath the surface including tail breaching, spy hopping and inverted tail lobbing! A few times Cajun and Pele surprised us all as they energetically surfaced right off the pulpits with loud exhalations! I may or may not have released a startled scream over the microphone, and I can’t say that’s the first time that has happened…. 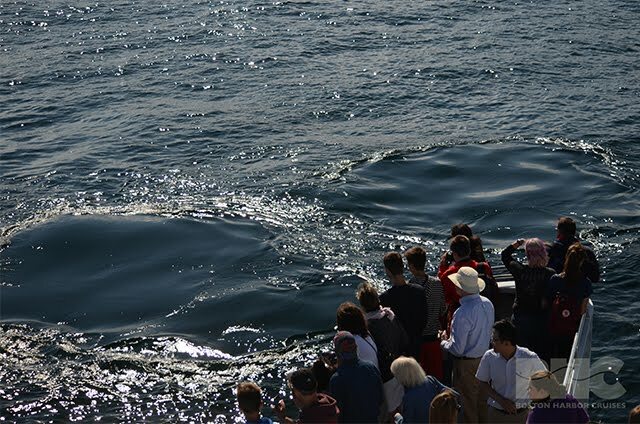 As we headed back home we came across two solo humpback whales both of which were making very long dives. The first one was an unknown with a monster dorsal fin that we have been seeing a lot this year. The second was Shards, a whale that was recently satellite tagged by Center for Coastal Studies. It was a beautiful and glassy ride home, a great way to end a long day on the water!